A decade after the American Civil War, Edward returns home from a hunting trip to find that his late wife Julia has been horrifically reanimated, and their son Adam has disappeared. Edward starts to record his experiences amongst the living dead that has torn his family apart, and potentially threatens all of mankind. Exit Humanity is a story told through the written and illustrated journal of Edward Young as he battles his way through an unexplainable outbreak of the walking dead. The first solo feature from writer-director John Geddes, the film stars Mark Gibson, Jordan Hayes, Dee Wallace, Bill Moseley, Stephen McHattie and Brian Cox. We may be awash with zombie movies of late, but this one does seem to be a rather good week for upcoming releases of more interesting looking genre pieces. Yesterday we had the news that Cuba's first zombie movie, Juan of the Dead, and here we have a movie that transports the genre back to post-Civil War America, which for reasons I can't quite put my finger on has a perverse logic to it. Maybe I've spent a little too much time playing Red Dead Redeption: Undead Nightmare. Genre specialists Fangoria were certainly enthusiastic, surprisingly praising the film's non-horror elements and describing as "A rare gem that transcends the genre, and sets the bar very high for horror films, period," while Ain't it Cool News called it "A cut above most zombie films. Geddes has a Terence Malick-like zen style of filmmaking going on." OK then. 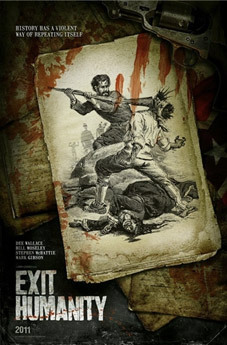 Exit Humanity will be released on UK DVD on 2nd July 2012 by Metrodome Distribution at the RRP of £15.99.